Rise. Shine. Soar. And live the life that truly calls you. Now! You’re no stranger to the extraordinary. You’ve had experiences that woke you up to a life of greater meaning and purpose. Maybe it was a near-death experience, a vision received through meditation, dream, ceremony, or dance, or a slow-burn spiritual awakening. Maybe you’ve been to hell and back in the shape of a great loss or devastating event. Whatever it is, your ordinary self has expanded beyond return and you know what’s truly important in life. You know you’re here for SO much more. You’re ready to respond to the call in even bigger and bolder ways. You’re prepared for action and success on your own terms. You’re primed to be unapologetically you in all that you do. But for whatever reason, you haven’t been able to make your big and beautiful vision a reality. You feel like you’re living in two-worlds. You long to step more fully into the life you KNOW is busting to come through you, and would, if only you knew how. Once upon a time, if you had an awakening you’d go to the wise elders and get guidance to master your new-found gifts and clarify your calling in the world. Unfortunately, that kind of support is rare these days. Some get the call. Few answer wholeheartedly. Fewer still become truly prosperous and successful in their chosen path. The Accelerator is a modern-day version of that ancient relationship of support and encouragement. It’s designed so you can refine your gifts, clarify the wisdom of your experiences, deal lovingly with the challenging bits that seek integration, and take steady action towards your most wholesome happy life. It’s your comprehensive place for exploration, support, community, joy, ease, and accountability. You’re living your most satisfying life. The kind that makes you deeply happy every single day. You’re in your ideal relationship. You’re at peace and harmonious with family and friends. You love what you do, knowing that every action is contributing something good for others, the planet, and future generations. Life is contagious. You know you’re spending time on this planet in the best way possible and creating true life wealth for yourself and others. You shine just by being you. That, my friend, is our destination. The Agents of Awesomeness Accelerator is for awesome people. You’ve had an awakening and want to more fully embody the life that now calls. Something extraordinary has awoken in you and you seek the guidance and support for what comes next. We use The 4-Step Agents of Awesomeness Accelerator to turn up the volume on the life, love, and path of leadership you desire. We meet every 2 weeks for live coaching. 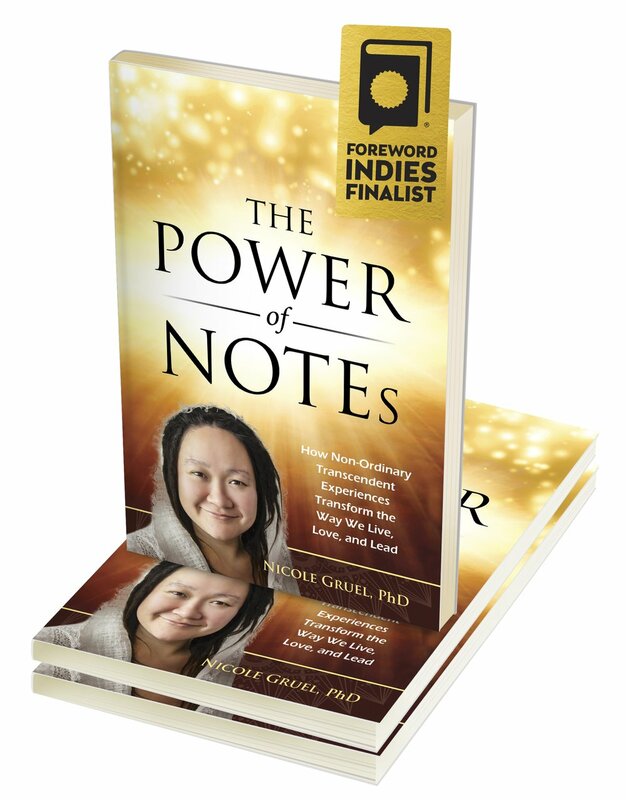 We’ll be using my book The Power of NOTEs as a companion guide. First, I help you get crystal clear on a compelling vision that’s in total alignment with your core. If you’re unsure, as many people are, I have fun strategies to help you figure it out. We’ll identify your current path of greatest ease, so that you can begin taking immediate enjoyable action towards your desired reality. Next, we harness the wisdom of your beyond-the-ordinary experiences. We’ll name the types of experiences you've had and discuss the aftereffects, both positive and challenging. We’ll explore where you are on your journey of integration, what’s most alive for you, and what’s needed to move forward as you consistently make your vision your reality. Most importantly, we’ll get in touch with the Mystery moving through you and what it wants you to do in the world. From here, we leverage your natural gifts and fullest potential. Using the Gifts Compass™, we reveal your personality’s unique melody and identify the forces of body, mind, and spirit that are your allies in charting a purposeful life course with ease and grace. We’ll gently address any resistance to achieving your vision. Now, we give your vision roots and wings. We focus on the life zones that are most important to you and create a strategic path in alignment with where you want to be. Through our biweekly coaching calls, I’ll keep you accountable, focused, and inspired to execute your plan. We’ll greet arising fears, resistance, and obstacles, and devise soulful strategies to work with and through them. Best of all, by taking ongoing action you’ll gain life-long skills to continue co-creating a life you love. My job is to empower you to create the life you most desire. You do the work. I cheer you on every step of the way. And now for the bonuses! You and I will have 2 private online sessions. The first is within the first couple of weeks of The Accelerator so that we can get to know one another better, dive deeper into your experiences, and do a debrief on your Gifts Compass self-discovery assessment (see next). We do all this early on so you can get the most from our time together and be crystal clear on your direction ASAP. The second consultation is a mid-way check-in. This online self-discovery tool clarifies your gifts and greatest personal potential. You’ll also have my unique understanding of the spiritual dimension of these gifts that’s often switched on or up because of NOTEs (non-ordinary transcendent experiences). In other words, your supernatural powers. This knowledge isn’t available anywhere else in the world in this same holistic way. When you truly know your gifts and how to optimally work with them, you’ll discover a new level of ease, joy, flow, and clarity in all areas of life. A fun way to expand conversations from the coaching calls and to get feedback and support from your Awesomeness tribe. unlimited e-mail support for 9 months! I am here for you. I want you to succeed. Joining us LIVE is always best, but if you can’t make it on occasion we’ll make sure you don’t skip a beat. 5 SIGNED COPIES OF the power of n.o.t.e.s! This book is a finalist in the prestigious INDIES awards. It’s designed to be a friendly, empowering and inspiring read. Gift them to others and go share the love. When I was a teenager, I had a near-death experience through drowning. That was the first time I saw the light. Literally. A big horizon of it. Then, within 6 months I lost several family members, including my father. Little did I know these experiences would shape my life path and one day I’d be helping other people make sense of their NOTEs. But finding my way didn’t happen quickly or easily. For a good decade, I travelled widely and meandered from one spiritual path to the next hungry to know what I was meant to be doing with my life and how to best be of service. I had epiphanies and peak experiences but they’d eventually fade and I’d still wonder how the pieces were meant to fit together. THEN MAGIC HAPPENED. I DISCOVERED THE POWER OF WORKING WITH MY NOTES AND TAKING CONSISTENT ALIGNED ACTION. NOTEs can be a powerful reset, a course-correction button, even the most powerful thing that’s ever happened to us. The problem is, most NOTEs experiencers have no idea how to translate spiritual experiences into everyday life. It’s wonderful to have a wealth of spiritual savviness, but useless if never applied. I want you to make the most of your N.O.T.E.s so you can get on with being the Force of Awesomeness you’re here to be. How good would it feel to finally be taking those next steps to create the life you’ve always wanted AND to know someone’s got your back? The 9 month journey and all the bonuses are $5000. There’s a monthly instalment option too. Think of it this way. How much time and money have you already spent on self-development programs, transformational workshops, sacred ceremonies, and spiritual pursuits that were temporarily awesome but not long lasting? How much have you spent on coaching programs that taught you a whole heap but resulted in little action or real change? And how much was that last holiday? If you’re like me, you’ve invested lots. And although, it was all perfect and part of my learning, I can now see that it could have been far more efficient if I’d just had a bit of sound and steady guidance. That’s exactly why I created The Accelerator, to fast-track your journey to your best life. The wisdom is already within you, I’m simply here to turn up the volume and get things done. If, by the end of the first live group coaching session, you feel this is not the right place for you then I’ll be happy to refund your money. Sign up here and be the first to know when enrolments for the next Agents of Awesomeness Accelerator open again. GO ON. MAKE this YOUR most dazzling YEAR YET. You’ll walk away with tools for a lifetime, meaningful connections, and new-found freedom from sharing your most profound experiences. But most importantly, you’ll be actively creating the life that feels 100% YOU as soon as we begin. If your toes are tingling with delight because you know this program was made just for you, click the magical orange button below and away we go! P.S. There are limited places. If you're on the fence, let’s talk in a FREE discovery session and decide if this is the right program for you. I haven’t had a NOTE.Can I still join the mentorship? There’s a good chance that if you’re on my website and reading this that you’ve had at least one NOTE. NOTEs come in many forms and there’s at least 500 different kinds currently catalogued. Any experience that stretches the boundaries of your everyday experience and expands you beyond your regular sense of self can be considered a NOTE. (Chapter 1 of my book The Power of NOTEs is a good place to consult if you’re not sure). Can I speak with Nicole directly? Absolutely! Each bi-weekly meeting is LIVE online and there’s always an opportunity to share your thoughts and feelings. The group coaching calls are an opportunity to share what’s happening for you and to jump in the coaching hot-seat. Also, included in The Accelerator are 2 one-to-one sessions, one at the beginning and another mid-way through. What if I can’t complete the entire 9 months? We’ll cross that bridge when we get there. If you’re both feet in and committed to the process, we’ll work it out. Promise. For your own sake, please only join if you’re ready to fully commit to you. This is an active experience where you’ll be invited to take continual action (even if it’s just baby steps). You can call on the group to keep you accountable. It will at times be challenging. This is a space to step into personal power and walk with grace and integrity. You’ll need a team spirit and expect the unexpected. If you want to make real your best life, you must be prepared to make changes, take sensible risks, and show up fully. All live group coaching sessions are recorded, so you can access the playback anytime. To get the most out of The Accelerator, it’s strongly recommended you block out all scheduled meetings ahead of time on your calendar. Make space for this sacred container of growth and support in your life. It’s an investment in you, after all! What day and time are the coaching calls? Usually around 10am AEST. Please check your timezone. That means afternoon for The Americas and late at the night for folks in Europe. Crowdcast and Zoom. You’ll need a headset or headphones, a camera on your computer, and a good internet connection. Best part, they’re easy to use. When you join The Accelerator, you’ll get a link to the online meeting space.